In this lavishly illustrated book, Charles Watkins celebrates the myth and magic of arboreal art. Open its pages and enter the greeny groves of the classical world, from Daphne’s metamorphosis into a laurel tree to the gardens of Pompeii. Shade yourself beneath the tree in sacred art, as represented in masterworks by Botticelli and Michelangelo. Exploring every leafy manifestation of tree art—from oaks as a symbol of nationhood and liberty across Europe, to the natural mystery and drama of forest interiors, the formal beauty of cultivated avenues, and representations of forestry over the ages—Trees in Art illuminates trees that are much more than mere plants. Taking in the fantastic and surreal arboreal art of Giuseppe Arcimboldo, William Blake, Arthur Rackham, and Salvador Dalí, as well as the work of contemporary artists like Giuseppe Penone and Ai Wei Wei, Trees in Art reveals the enduring practice, genius, and meaning behind how artists render trees. Drawing on exquisite artworks and Watkins’s deep knowledge of the history and ecology of trees, the thematic chapters of Trees in Art take us on an enlightening journey through centuries of verdant, artistic engagement with a natural form that seems to mirror and allegorize the human path through life. "Filled with paintings, drawings, and illustrations, this book celebrates arboreal art through the centuries from Salvador Dalí to David Hockney." "With Corot’s stunning Fontainebleau, in the Forest on the cover and 203 illustrations on its 256 pages, Trees in Art might resemble a 'coffee-table book,' but there is more depth to it than that. Watkins, a professor of rural geography, has recently written two books on woods and forests and his knowledge shines through. . . . A beautiful, fascinating and entertaining book, on quality papers, and well worth £35." 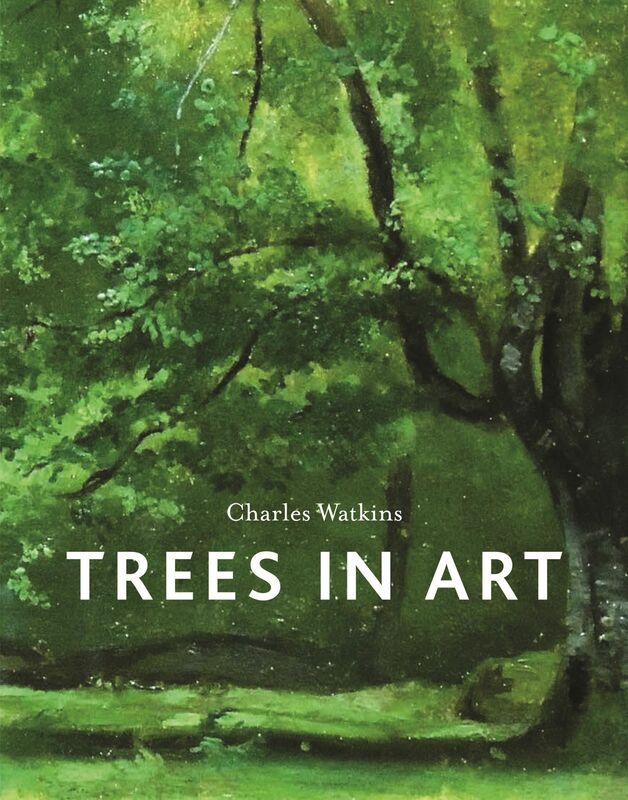 "Watkins draws on his deep knowledge of the history and ecology of arboreal art through the centuries. . . . A fascinating tour of artists’ arboreal obsessions, Trees in Art will appeal to anyone interested in trees and the landscape." "[A] fascinating book which explores every aspect of trees in art. . . . Its thematic chapters range from a chronological walk-through of the work of early artists to the use of trees in representations of nationality, revolution, and war; plus, a look at contemporary sculpture; a surprisingly compelling twenty pages on the practices of lopping and pollarding, and, my favorite, a section on trees in mythology. You could learn a lot about things you might never thought would interest you, but which actually do." "As Watkins makes clear in Trees in Art, especially after Claude and the rise of landscape in eighteenth-century Rome, trees often became mere devices for framing views. Ruskin felt it was virtually 'hopeless' to paint 'dark masses of laborious foliage.' Thankfully for us, artists from Giuseppe Arcimboldo to Max Ernst have given it a go." "[A] wide-ranging survey. . . . A useful book offering botanical insight and valuable sections on artists as diverse as Leonardo, Millais, Klimt, Corot, Lear, and Gainsborough." "This extraordinary cross-disciplinary work is a remarkable piece of scholarship, full of fascinating knowledge and illustrated with an unexpected assembly of visual material that confirms the richness of tree art across the ages." "Throughout history, art has captured understandings about the natural world that science can take millennia to explain fully. That plants, in all their incredible variety, have always inspired the visual and literary imaginations is confirmed, wonderfully, in [this] book." "Jam-packed with illustrations, top quality photos and words, a fascinating compendium on the role trees have played in art."